Note: This article is for QODBC users with older version of QODBC v6, 7 or 8. Or for those who cannot use RDS or QRemote to connect to QuickBooks remotely (e.g. x64 system user). For QODBC v9 or above users who can use RDS, please see: Accessing QuickBooks data remotely via QODBC v9 and above using RDS instead. 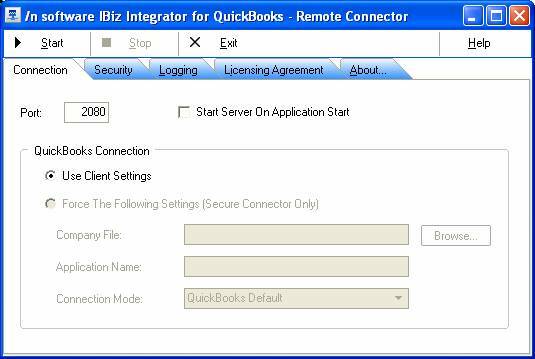 In QODBC v9 the QODBC Remote Connector has been replaced to use QuickBooksRDS - The RDS client and server components are available on the website at: www.qodbc.comdownloadRDSInstallRDSClientInstaller.exe and www.qodbc.comdownloadRDSInstallRDSServerInstaller.exe. QODBC has the ability to talk to a copy of QuickBooks running anywhere in the world over the Internet, or over your local area network. This feature is built-in and requires no additional charge. You just need to download and install our current QODBC driver release. Using this feature allows you to set up multiple workstations with QODBC on a network to call a server or another workstation on the network (or over the internet) that's running one copy of QuickBooks. Note This feature transfers data in an unencrypted fashion (plain text), so if you are using this feature over the open Internet with live data you may want to consider purchasing the QODBC SSL encrypted version of the iBiz Integrator from us. If you need to connect to a remote QuickBooks file securely across the internet itself from a server, please contact us with your requirements and we will tailor a solution. To get this feature to work, simply install QODBC on both the machine you have hosting the data (the one running QuickBooks) and the machine you want to use the data from (the remote system or client). Once this is done, a few simple settings in the driver setup screen are all that is required to use this data remotely. The iBiz Remote Connector is a new module that ships with ALL versions of QODBC including the evaluation. It can be started on any console that has a version of QuickBooks running. Click on Start -> All Programs -> locate the QODBC Driver for QuickBooks program group on your desktop -> select the QODBC Remote Connector. This will launch the IBiz Integrator Setup. The Connection tab allows the setting of the HTTP port the Remote Connector will use. The default is 2080. Write this down and use the same port number when setting up QODBC to communicate with this Remote Connector. Click Start Server on Application Start to make sure this connector is always running. It is recommended that you turn on authentication. If turned on, the values specified here must match the values on the QODBC Advanced Setup screen to communicate with this Remote Connector. Right-click the network icon in your system tray and select Status, then click on the Support tab and write down the IP number assigned to this machine. We also recommend using SSL Encryption/Security if your LAN is not a secure connection, i.e. the internet. You must purchase an upgrade from us to use this option. Only the remote systems or client machines performing queries with QODBC and getting results need the SSL upgrade key, not the host - the PC running QuickBooks. After the Remote Connector is configured, press the Start button to turn on the Remote Connector. You can close the screen (By pressing the X) and the Remote Connector will be removed from the screen but remain in the system tray. When you wish to stop the Remote Connector, right-click on the system tray Icon, select Show then press the Stop button then the Exit button. Click on Start -> All Programs -> locate the QODBC Driver for QuickBooks program group on your desktop -> select the QODBC Setup Screen. The Remote Connector tab lets you configure a remote connection. Selecting the Remote Connector brings up the Remote dialog box. 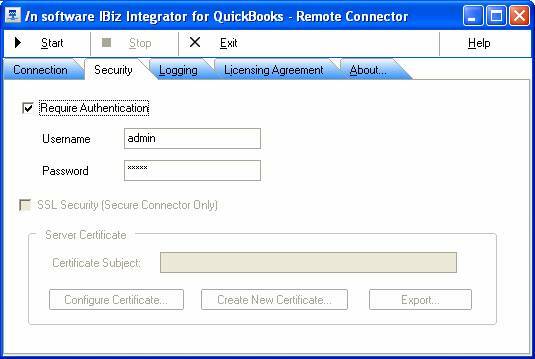 Checking the Connect to /n Software’s iBiz Integrator for QuickBooks Remote Connector check box activates the fields required to setup connecting to a Remote Connector running on another computer or even on the same computer. The connection string attribute for this item is IBizRemoteConnect. It can be set to Yes or No. The default is No. The URL addresses the host computer's URL and port that will be or is running the Remote Connector. The connection string attribute for this item is IBizRemoteURL. Its default value is "http://localhost:2080". An IP address can be supplied instead of a computer or domain name. An example would be http://198.49.210.1:2080. The IP number in this example "198.49.210.1" should be replaced with the number you wrote down earlier when setting up the Host machine (see above). The port,2080 in the examples, must match the port the Remote Connector is configured to use. The User Name is required if authentication is turned on in the Remote Connector you are connecting to. The username must match the one configured in the Remote Connector you are attaching to. The connection string attribute for this item is IBizRemoteUID. The default is an admin. The Password is required if authentication is turned on in the Remote Connector you are connecting to. The password must match the one configured in the Remote Connector you are attaching to. The connection string attribute for this item is IBizRemotePWD. There is no default value. Ask for the password if the invalid option can be checked to allow the user to enter a username and password if the ones in setup are not valid. During connection, the user will be prompted to enter a username and password. If not checked, and the username and password are invalid, then an error message is returned to the calling program. The connection string attribute for this item is IBizRemotePromptForPWD. The valid values are Yes and No. The default value is Yes. The timeout can be used to configure how many seconds QODBC will try and connect to the Remote Connector. The connection string attribute for this item is IBizRemoteConnTimeOut. The default value is 120 seconds. The SSL Cert is used with the upgraded SSL Remote Connector. If you create your own certificate using the Remote Connector, you can export that certificate to a file in the Remote Connector. The SSL Cert is a path to that file or a copy of that file. The connection string attribute for this item is IBizOESSLServerCert. The default is an empty string. The “…” can be used to search for the file in the file system. Many sites use a router box to connect multiple PCs to a single broadband connection. When setting up a host to allow a remote PC to access the data on a machine, you will need to setup "Port Forwarding". In the case of a router, you are using only one network address (IP Number) but your router is allowing multiple computers to share this number. If you setup port forwarding, the router will be able to determine which PC in your shared network should get the incoming call from the remote user. Check your router configuration for further details. Customers who do not have a persistent IP number (network address) such as those using dial-up internet, cable or DSL internet services which can change the IP number at any time, will need a small amount of additional setup to allow communication with their system even as the IP number changes. Try a free service like no-ip.com or zoneedit.com - these services will give you a physical name on the internet that will stay the same no matter what your IP number changes to, allowing you to set it up once and then forget it. Reconnect Delay can be used to configure how many seconds QODBC will wait after it disconnects. This allows QuickBooks time to unload properly before the calling application returns to reopen the connection. The connection string attribute for this item is IBizReconnectionDelay. The default value is 0 seconds. Note: The Australian edition of QuickBooks is shown above. USA, Canadian and UK versions of QuickBooks do differ in appearance and operation, however, the technique shown here still applies. A: Yes, but the QODBC SSL Remote Connector simply encrypts the connection so no one can read the data stream between the two computers. QODBC communicates with QuickBooks which in turn talks to the actual companyfile.qbw file. QODBC doesn't read the companyfile.qbw file directly, so QuickBooks needs to be running somewhere, either on the computer itself or another computer via the QODBC Remote Connector. QODBC needs to be licensed for each computer, so you will need a minimum of two licenses. Note: The QODBC SSL Remote Connector is no longer available for sale. We will be working on a replacement, but in the meantime, the free unencrypted remote connector will continue to be bundled with QODBC. Q: I need to be able to access 3 different QB company files that reside on the same server. Can this be done? I think I could run three instances of the iBiz Connector each with its own unique port, but I need it to connect to the company files in unattended mode (i.e., not have QB running). I wanted to try the "Force the following settings" but it is grayed out. Do I need to buy something? If I did, would it work? A: "Force the following settings" is for the optional SSL component we no longer sell. The problem here is that QuickBooks can only have one company file open at the one time. So if you want to have three different company files open, you need to set up three client DSNs with the different company file names (paths) and open one at the time. The Reconnect Delay (in the QODBC Setup Advanced tab) can be used to configure how many seconds QODBC will wait after it disconnects. This allows QuickBooks time to unload properly before the calling application returns to reopen the connection to the next company file. Note: The rule is ALWAYS used VB Demo to run through the DSN used by your application first before setting up the Remote Connector. Make sure VB Demo can use the connection on the computer with QuickBooks first in an unattended mode as per How to setup QODBC for Auto-login into QuickBooks, then set up the QODBC Remote Connector on the computer with QuickBooks and make sure VB Demo still works. Then copy the settings to the computers without QuickBooks as above.